It’s finally finished – and those pesky lamp posts have gone. It has to be said that what’s good is very good – a wide, smooth surface where cars, pedestrians and cycles are given their own space – and the link at the Magazine end doesn’t involve waiting ages on the traffic island. On the downside, still to be sorted is a safe entry and exit to the bike lane at the Welford Place end and there is still a problem with people using it a short term parking. Dave’s video shows the problems at the top end. Here we illustrate why the lane needs to be made harder to park a vehicle on. So, after months of telling all who would listen at the City Council how important it is for a cycle lane to be useless for car parking, the plans were finally published. With no bollards, armadillos or anything you can’t drive over – just a 125mm kerb to keep vehicles off (“we do not to intend to install any bollards until and if such a need arises”. The safety audit also identifies this as a problem – but not one that will be addressed immediately. This is unacceptable. The trial phase of this project had vehicles parked on the cycle facility. All cycle facilities in the area have cars parked on then on a regular basis and cars parked here will force cyclists into a busy traffic lane or a footpath. So, when it’s completed (expected before Christmas), if you see a vehicle parked on the Newarke St cycle lane, PLEASE PLEASE take a photo and send it to us. You can tweet pictures to @leicesterccg , put them on our facebook site or email them to us. 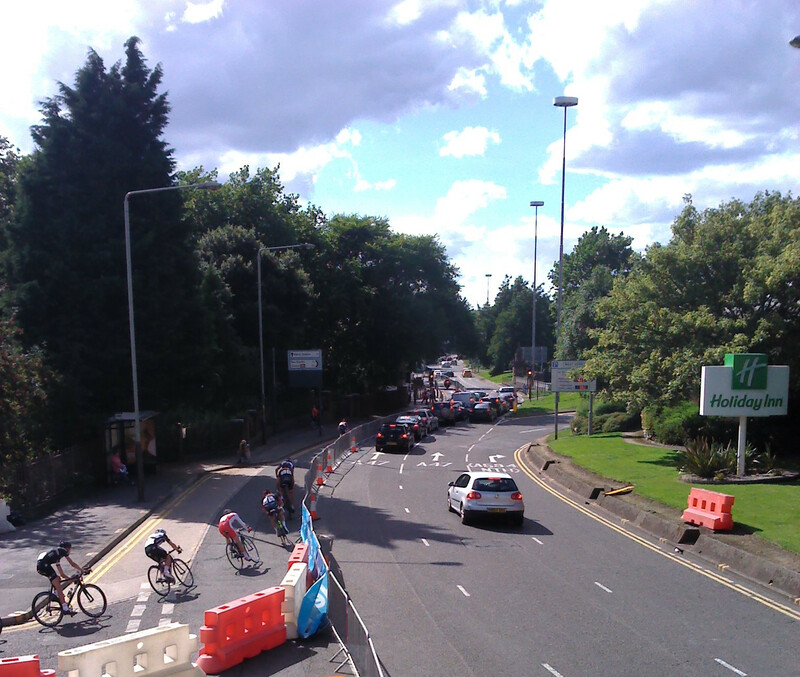 Thanks – you can help make Leicester better for cycling. Here are a couple of photos to show how Leicester drivers enjoy parking illegally on new cycle facilities (and test out our gallery capabilities). Thanks to vyber man on youtube for the head-on shot. Newarke St cycle separation update. 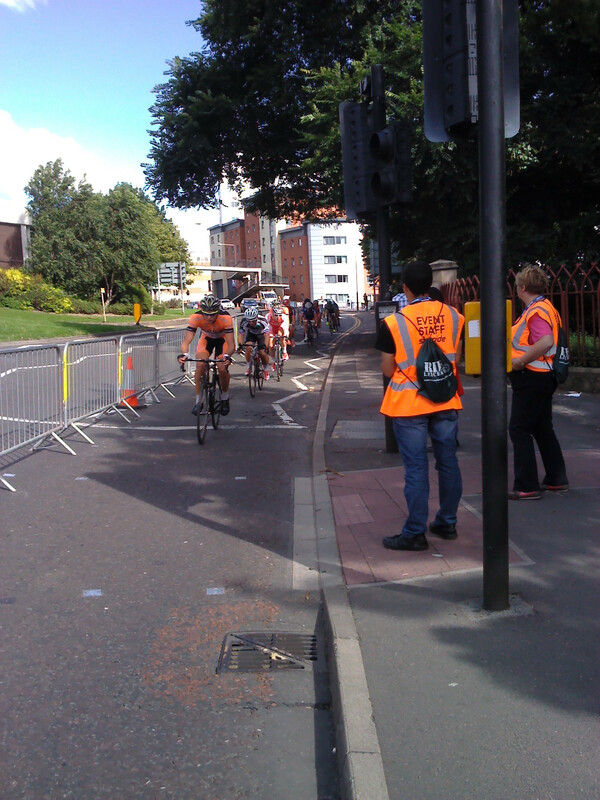 We saw Andy Salkeld (Cycling Officer, Leicester City Council) at the Cycle Classic cycle race and asked where we are with the issue of separating the cycle lane on Newarke St from the traffic lane. To paraphrase slightly, it comes down to the outcome of the safety audit which will determine is there is a risk to cyclists from motor vehicles on the cycle lane. Cycle City Workshop 19 June 2013 – with added Mayor! The Cycle City Workshop is a monthly meeting organised by the city’s Cycling Officer, Andy Salkeld. Regular attendees include representatives of the City Council, Sustrans, Leicester Uni Bicycle User Group, the CTC, British Cycling and of course Leicester Cycle Campaign Group. This month was a bit different. Andy is on holiday, so his boss Bona Maturi chaired. Barry Pritchard, one of the senior highway engineers and responsible for delivery of the Connecting Leicester project was there. So was Peter Soulsby, City Mayor. LCCG has been trying for some time to meet with him to follow up our briefing document about options for separating the cycle lane from the traffic lanes so we were particularly pleased to have the opportunity to catch up. David Oldershaw of East Midlands Trains presented plans for the 300 space bike park planned for the railway station. He has involved LCCG and local cyclists from the start of the process and has already included a number of our suggestions. We now know that there will be no lockers because the area is under a live railway line and TransCo who are responsible for security say no (in case anything explosive gets left there). Panniers on bikes will be fine though. There will be no formal spaces for tandems / trikes / trailers but it looks like it will be possible to find room for them. Barry presented plans for the Newarke St bike lane, with the proviso that they were still work in progress, with more detailed plans coming to the next cycle city workshop. The plans currently show a granite kerb and Barry explained that bollards need separation on both sides which will reduce the cycle lane width. LCCG has presented other options such as ‘armadillos’ (see our briefing) which will be considered. All parties were in agreement that this is an important piece of infrastructure which has to succeed if we want other road reallocation projects to go ahead. Hence it will be designed (and changed if necessary) to prevent parked cars rendering it a useless embarrassment. Currently the lane is shown at 3m wide with a thick (200mm) white line separating the pedestrian and cycle spaces. Concern was expressed about lack of continuity at Marble St – we think the lane should be continuous across this low traffic side road with no change in level, and a change in level for motor traffic crossing here. What happens at each end of the cycle lane is also TBC. Work has already started on the link along Southgates from Jubilee Square /. Applegate to Newarke St. This was previously discussed at the CCW and our preference for a facility on the Shakespeares Head side of the road taken forward. The Newarke St end finishes at the existing crossing past the Friar Lane turn which is sensible. We felt that this was an extremely positive meeting – there’s nothing like talking to the people planning and responsible for infrastructure. We look forward to seeing them regularly in the future. Leicester has won funding from the DfT to take a lane out of Newarke St and use the space to improve the pedestrian and cycle links between the DMU campus and New Walk / the city centre. We presented a document to Councillors Clayton and Clarke outlining how we think the Newarke St bike facilities should look. Update 9pm – Cllr Clayton has taken our document to the Mayor who read the whole thing. Thanks Neil!